This giant world map poster is simply stunning, with neutral tones and a vintage style. World map features political detail (countries shaded in different tones), country boundaries, cities and time zones, making this a stylish and practical antique world map poster. The extra large map of the world is designed by specialist map makers with high levels of cartographic detail, making it perfect for kids, adults or lovers of vintage maps of the world! The laminated world map measures 77.5 x 46 inches with a 1:20 scale, and is finished with an encapsulation process which heat seals the antique world map between two sheets of industrial quality film, allowing the world map wall poster to be written on with whiteboard pens. Please note that the edges of this world wall map are not sealed, and wooden hanging bars are not included. Your vintage style world map laminated poster is supplied in secure, protective packaging, rolled in a tube for crease free delivery and immediate display. HUGE WORLD MAP: Giant map of the world measures 77.5 x 46 inches with a 1:20m scale, making it an eye catching addition to large family rooms or offices. 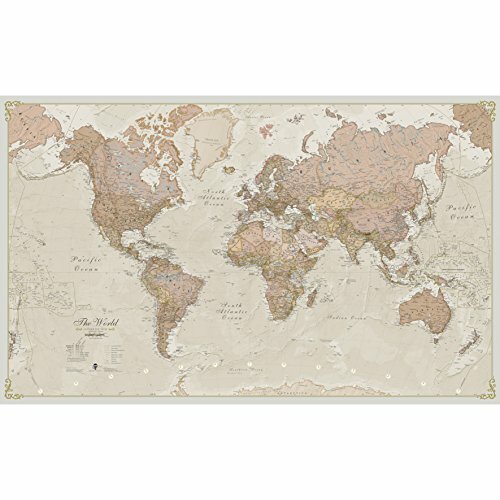 VINTAGE STYLE: World map features stunning neutral tones, which will blend with any home décor. The antiqued world map details countries, cities and time zones. LAMINATED MAP: We supply this world map poster laminated by heat sealing it between two sheets of industrial quality film. CREASE-FREE DELIVERY: Your colorful political map of the world is rolled in a tube for delivery, so it arrives ready to display. If you have any questions about this product by Maps International, contact us by completing and submitting the form below. If you are looking for a specif part number, please include it with your message.